In markdown you can make a link clickable using a certain syntax (you have GUI options that automated that or you can follow the syntax). This is great as it hides the ugliness of long urls behind a user friendly name. 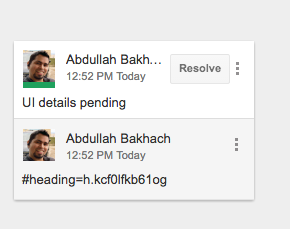 My question is: how can we do this in Google Docs comments? If that's not possible, is there a way to provide a relative link in Google Docs to the header (as opposed to showing the whole link)? Google Comments automatically convert inserted full URL to links but it doesn't do the same for anchors. Google Comments use the same formatting than Google+ posts. There is no formatting option for URLs, so is you would like to avoid long URLs you should use a URL shortener. How do you make an en dash in Google Docs? Can you resolve Google Docs' comments by email?